The Advanced Supersonic Parachute Inflation Research Experiment (ASPIRE) 2 payload undergoes testing in the sounding rocket payload facility at NASA's Wallops Flight Facility in Virginia, prior to transport to the launchpad for a planned March 27, 2018, test flight. Update for March 30: NASA will now launch the ASPIRE Mars parachute test flight at 10 a.m. EDT (1400 GMT) on Saturday, March 31. Original Story: NASA will put the supersonic parachute for its next Mars rover to the test once again Thursday morning (March 29), and you can watch the action live. 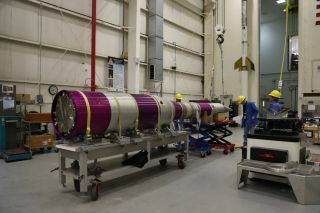 A sounding rocket carrying the Advanced Supersonic Parachute Inflation Research Experiment (ASPIRE) is scheduled to launch from NASA's Wallops Flight Facility in Virginia on Thursday between 6:45 a.m. and 10:15 a.m. EDT (1045 to 1415 GMT). You can watch it live here at Space.com, courtesy of NASA TV Wallops. The launch likely won't be visible to anyone outside of the immediate Wallops area, NASA officials said. If all goes according to plan, the 58-foot-tall (18 meters) Terrier Black Brant IX rocket will loft ASPIRE to a maximum altitude of about 32 miles (51 kilometers), where conditions in Earth's atmosphere mimic those of the thin air of Mars. The parachute will unfurl shortly thereafter, while ASPIRE is traveling faster than the speed of sound, and high-speed cameras will record the whole thing. ASPIRE will eventually splash down in the Atlantic Ocean about 40 miles (65 km) off the Virginia coast, where it will be retrieved by boat, NASA officials said in a statement. Engineers will study the chute, the video and a variety of other data to determine how ASPIRE performed. Their conclusions will inform the final design of the supersonic parachute that will help get NASA's 2020 Mars rover safely down on the Red Planet, NASA officials have said. The car-size vehicle, which is based heavily on the agency's Curiosity Mars rover, is scheduled to touch down in 2021 to hunt for signs of past life on the Red Planet. This will be ASPIRE's second test flight. The first came in October 2017 and also employed a Terrier Black Brant IX that lifted off from Wallops. During that flight, the parachute unfurled at an altitude of 26 miles (42 km) while the ASPIRE payload was traveling at 1.8 times the speed of sound. Editor's note: NASA postponed the ASPIRE parachute test launch to no earlier than Thursday, March 29, due to rough seas in the recovery area in the Atlantic Ocean. This story has been updated with that new launch target.